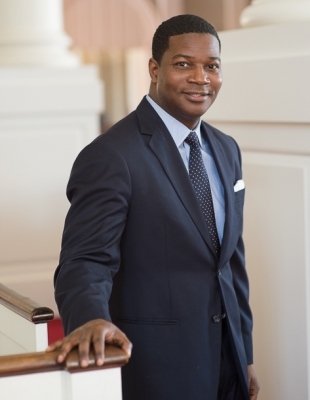 Jonathan L. Walton is a professor of Christian Morals at Harvard University and also the minister at Harvard’s Memorial Church. He gave this presentation essentially on broken, brown bodies. He discussed how he held a “die-in” for the lives of Eric Garner, Trayvon Martin and other black bodies lost and broken by police brutality. He held this event on the steps of his church during a Sunday morning service of the Eucharist. The Eucharist is the Christian ritual of “eating” the body of christ and “drinking” the blood of christ. It is a ceremony to honor, respect, and appreciate the sacrifice Jesus Christ made for the followers of Christian faith. He talked about how when people exited the church to see this demonstration of a peaceful protest, some church goers were supportive and understanding of the situation, while others were upset that their Sunday “Celebration” was being polluted with “political antics.” He told us that this woman’s complaint made him think, why is there a difference? Why is one more important than the other? Why can’t this be religious and why isn’t religion political? Christians celebrate the crucifixion for jesus, but this die in for broken brown bodies is wrong/political/doesn’t belong in the church. They are fundamentally the same, images/ritual in remembrance of lives lost/sacrificed. He explains that the black body arrived in america as a commodity, and item to be sold. This makes a black body less than a white body, there is no concern for a broken black body in the church, but there is concern for the white body of christ. He claims that to deny their validity of life, is the opposite of the Eucharist. He advocates for a rethinking of religious ritual, the Eucharist and our definitions of death and suffering. On thing that really stuck with me was his suggestion to replace the blood and body of christ, with an arizona and a bag of skittles in remembrance of the death and suffering of Trayvon Martin. One of the last points he makes hit me very hard. He explained that segregation/discrimination is not a black/brown problem, it’s a white problem. It is the WHITE responsibility to change, effect and be conscious of equality.. Being a minority, brown body myself I never really thought of things in this perspective, and for that I’d like to thank Professor Jonathan L. Walter for coming to our campus and presenting this lecture. I think what Professor Walton was saying relates to Durkheim’s idea of the totem being representative of society worshiping itself. In a religious society, they pray and worship a totem, this totem represents them, thus they are worshiping and praising themselves. To me there are many things that can be a totem besides a cross or religious symbol, in the case of the Eucharist, these totems are the blood and body of christ. Professor Walton’s suggestion of the rethinking of these totems becoming the skittles and Arizona tea would be the indication of the image of society changing. The people who want to keep these “political” issues out of the church seem to simultaneously support the white traditional society that these Christian totems represent. By changing the totem, we change what we see as representing of our society. It is a lack of acknowledgement and respect for this broken brown bodies.